An honestly priced, rugged and reliable running watch. It's not glamorous, but then nor is slogging through sleet at 7am. The Polar M400 won't let you down, and the heart-strap bundle is a great all-round package. 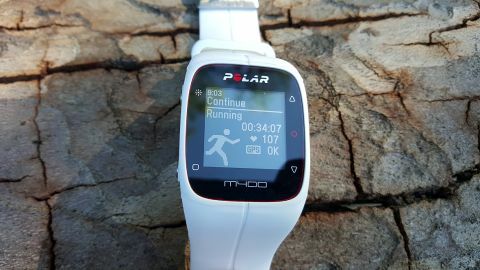 The Polar M400 GPS running watch is now a senior statesman of the running watch world, and with its separate heart rate chest strap, could be seen as a little first-gen by wearers of 'new-fangled' Apple Watches. That said, the Polar M400 was one of the best pure running watches around when it launched in 2014, and it now represents pretty good value, although we reviewed it with a bundled Polar H7 heart-rate strap, which pushes the price up a bit. [Update: It's worth noting that this watch isn't widely available - and the strap bundles even less so (although you can just buy your own) so be wary. Also, the excellent Polar M430 has come out to usurp it - with greater metrics and accuracy, it's a nifty piece of kit that's one of our best fitness trackers and worth a look even if it is a fair amount more cash]. Polar has considerable experience in the heart-rate tech market, and it brings its expertise to this relatively entry-point-priced product to lift it far above much of the competition. As with competitors such as the FitBit Surge and the Basis Peak, it's also got the activity tracking smarts of a simpler fitness band, so you get two in one, although arguably the value is mainly on the running side. However, it's a holistic approach by Polar which can't really be carped at. As you can probably tell, I like this running watch. Design-wise we're are in a slightly retro, functional place, which is the only real negative about the Polar M400. The plus side of this is that the screen is big enough to see clearly what's occurring when one is charging about, something that physically smaller running watches struggle with. It is monochrome dot-matrix style though, so nothing too smartwatch-esque (although a recent update has added notifications), but there is an excellent backlight, and the contrast is adequate in low-visibility situations like driving rain. The back of the case is stainless steel, and contains a single micro-USB port with a tiny attached cover. The port covers off charging and PC or Mac syncing, via a standard, micro-USB phone charger - rather than some lumpy, proprietary nonsense. Hoorah! Battery life without alert trickery is perfectly decent, with about eight hours of life with the GPS turned on, translating to a casual two-to-three of weeks-worth of regular training runs. The simple, killer feature here, though is that charging is simplicity itself, thanks to the use of micro USB rather than complex cradles that you subsequently lose or break. The build quality of the Polar M400 running watch is excellent overall. The lightly rubberised strap in black or white has a not-unpleasant texture, and hasn't perished or hardened in regular use over several months. There's a vast range of adjustment available in the traditional hole and buckle strap, and there's room for truly stick thin and the excessively brawny wrists alike. The buckle itself is stainless steel, so no allergy or durability issues, and is the double type, trapping the spare strap as well. A small retainer completes the job, and it's a good 'un - it stays firmly put in use, and due to the lack of inbuilt HR monitor you can wear it as tight or as loose as you fancy - you can even buckle it to a running bag or bike handlebars if you fancy. The cover contributes to a claimed waterproofness to 30m. We've not taken it diving to test this to destruction yet, but in normal running use (sweat, showers, cleansing rinse under tap) there have been no issues. At 56.6g and 11.5mm thick the Polar M400 Running Watch isn't the chunkiest on the market, coming in around the middle of the range - it's easy to wear all day. Intuitive is the word for basic operation of the Polar M400 running watch. Any idiot will easily be able to pick it up, hit the central button to begin tracking your exercise, tab up and down to pick which one (running, cycling, other indoor, other outdoor), tap again and you're off. The GPS sometimes takes a few seconds to lock in, but it's acceptably quick, and easy to skip on in the interface while the chips grind away, hunting satellites. GPS accuracy is consistently good, and has a fast enough sample rate to avoid the 'shortcuts through buildings' moments you sometimes find when you zoom in on the maps for more granular detail. Once you're moving, there are several screens to tab between to pass the time, from Altitude (current, time and gain), Heart Rate (current reading, the all-important zone and time), Lap (a/b Laptime, current lap and HR), Pace, and Split. The great benefit of this is that the data is all displayed logically and has space to breathe, rather than attempting to cram it all onto a single screen. When heart rate training, it's a simple matter to head over to the HR screen and once you've reached your threshold value hit the central button to 'lock' it to that value. There is one flaw here, which is that alerts for leaving the 'locked' HR bands are audible only - no vibrate - so if you're listening to motivational power ballads, you'll need to keep checking visually. Still, it's effective and low effort. The Polar H7 pulse monitor strap - which is also separately available if you just want to buy the watch initially - is perhaps the most accurate I've tested, never failing to get a reading within seconds of clipping the pod in, and never dropping out, in many hours of testing. Speaking of low effort, the excellent Back to the Start feature is worth a mention. This stroke of genius uses the GPS in the watch to drop a marker at the beginning of each run. Toggle the setting on and a compass arrow will give you the most direct route back to your start point. For training runs in foreign cities or rural areas it's extremely handy, although your regular route probably doesn't demand this level of navigation, unless there's something wrong with you. The screen really impresses when in use. Those over-large numbers look a little simplistic when stationary, but once you're in full flow they're a real boon. Interestingly, while the watch as a whole is almost exactly the same size as the (admittedly classier-looking) Fitbit Surge, the screen real estate is actually considerably larger. It's a case of function-dictated design rather than fashion. That's something you'll be glad of mid-marathon. I'm a bit conflicted about the Polar M400's pulse tracking. On the one hand it's super-accurate and bomb proof. On the other, that's because it's via a Polar H7 Bluetooth chest strap, not a TomTom Cardio-style wrist-mounted solution. As chest straps go, it's a cracker, with Polar's HR expertise contributing to a super-accurate, annoyance-free reading every time. It's my go-to model for control testing other HR monitors, which says a lot. The CR button cell power source is stashed behind an o-ringed screw door, giving the H7 pod a waterproof depth rating of 30m. The oversized two-popper button attachment method is secure and also allows you to 'half' clip in the monitoring pod without leaching battery, for example in storage or if you're journeying to a long event all geared-up. A further nifty design touch is a plastic cup for each popper, so if you're half-clipped in, the metal doesn't make contact. The strap is simple to adjust correctly, and is proper fit and forget, although the hook-and-loop is impossible to manipulate without visual reference, so best done at home unless you're happy exposing your torso on the roads. The Polar software world is varied one, and there's actually a series of Polar Loop apps. There's also sync software for your desktop, which then squirts your stats into the Polar's Flow data-tracking site. Syncing via the desktop app can take quite some time if you don't keep up to date, so it's worth making it a weekly task. If you're using the smartphone app you can also visualise all your data on there, as well as setting up your alerts, if you're an iPhone user. The Android app - which I tested - has clearly decided to focus on simplicity rather than data overload, which I rather like. It delivers a more in-depth version of the rundown you'll see on the watch after each bout of exercise. The app is logically laid out, with an activity section consisting of a massive dial to indicate how long you've not been active, and a separate activity log/diary set out by week. You can easily navigate to a specific session, then drop into a deeper level of detail comparing pace, heart rate, distance, calories burned, etc. There's also a range of smart coaching options, the first of which you'll notice cropping up across the app and the watch itself. It's a handy micro-breakdown of what your session just achieved - for example tempo training, steady state training, etc - and what benefits that gives you. It's a brilliant bit of analysis that adds value without perplexing with vast reams of data, and gives you a clear indicator of how you're progressing. You'll also be able to view the results of your Polar fitness test in the app. This is a highly accurate test based on heart rate data and fluctuations at rest that will provide you with a VO2 max figure that can then be used to track your performance in greater detail. Other features are sparse on the Polar M400 Running Watch, it's pretty dedicated to the temple of running. But there are a few. The fitness test I noted above is the most notable, giving you a genuine science boost to your training. Less scientific is the alarm, which can be set via the smartphone app or the watch, but weirdly the smartphone not only has far fewer options, but also requires activating a sync with the watch. Another slightly leftfield option is to use the excellent Polar H7 HR monitor as a standalone belt, synced direct to your phone (iPhone and Android supported) via Bluetooth. Handy if you've forgotten to charge the watch and are hell-bent on a session. A recent update has added smartphone alerts for incoming calls, received messages and social media events, but this is iOS only at the moment, and will add considerable battery loading to your phone and watch alike. Android alerts are apparently in the works, I'll keep you posted on their arrival. The M400 can also serve as a step counter, and makes a decent fist of it, but obviously this does require you to wear what is a fairly ugly watch all day. The Polar M400 isn't a high-end runner's wearable like the Garmin Forerunner 920XT but it's a great device. It's easy to use, rugged and works every time. The battery life is also sufficiently good that it's actually a source of surprise to me when it does need charging - I usually can't remember when I last plugged it in. The HR strap is another big plus in terms of accuracy and reliability, though it looks rather old school compared to the new breed of wrist-based HR-trackers. In short, the M400, especially now it's a little more mature in years offers value that puts pricier running watches to shame. The design is a little Innovations Catalogue, a little medical supplies. A spritz more style and this would be untouchable. My only other reservation is the slow syncing. The time taken does feel like you're streaming a box-set sometimes, when actually it's an alarm update and the data from a short jog session. The Polar M400 feels like an honest product - it does what it says on the tin, and does so with minimal fuss. If you want a smartwatch or complex activity tracker then you should almost certainly look elsewhere, but if you want a proper running watch with some fringe benefits then this has to be on your list.